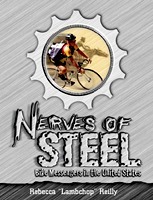 Review: "Nerves of Steel: Bike Messengers in the United States" by Rebecca "Lambchop" Reilly. Spoke & Word Press. $39.95. 342 pages with illustrations. REVIEWER'S DISCLAIMER: I am a friend of author Rebecca Reilly, and she favorably mentions me in her book. I believe I've made a sincere effort to be objective; nevertheless it is my responsibility to inform you readers of these facts. In recent years there have been several books by and about bike messengers, including the photo collection "Messenger Style" by Philippe Bialobos and the novel "Godspeed" by Lynn Breedlove. "Nerves of Steel: Bike Messengers in the United States" is the first comprehensive look at what is at once both an ancient and modern profession. "Nerves of Steel" was written by Rebecca Reilly, whose three-part article "Bike Messengers at the World Trade Center" appeared recently in the SF Call. As Reilly observes, the courier vocation goes back at least 4,600 years to ancient Egypt. Yet messenger work with a bicycle is barely more than a century old. Reilly examines nearly all facets of the bicycle messenger profession, including economics, culture, and geography as well as history and working conditions. Her personal experience of ten years "messing" (her word) in San Francisco and eight other U.S. cities is supplemented by resources as varied as nineteenth- and twentieth-century Congressional documents, novels, university studies and periodicals as well as nonfiction books. In this her first book, Reilly uses these resources to undertake a heavy challenge. The messenger experience is as obscure as it is panoramic. To write about any part of our way of life is difficult; to present a comprehensive overview is virtually impossible. Needless to say it will be easy to find faults with such an effort no matter who the author. Reilly does make errors but her total effort stands as a valuable contribution to and for a very public yet little-known group of workers. In the introduction, she announces that her theme is "to show the diversity of the messenger community and cover, at least in general terms, all of the factors that are in the bike messenger environment." To meet this challenge to present a comprehensive view of such a vast and previously unexplored topic, she has composed "Nerves of Steel" of two different sections. The book's first section (Parts 1 through 3) analyzes messenger history, economics and culture. Her look at our history remarks on the many contributions made first by foot couriers and then by horseback messengers. For example, messengers helped develop agriculture by building wells at their way stations. In U.S. history she cites Paul Revere and the Pony Express, as well the heroics of lesser-known messengers. For those interested in the messenger-unionizing effort, the second chapter on economics and working conditions is vital. Here Reilly clearly and concisely exposes the scam of “independent contracting” that still plagues our profession throughout the country. Among other things it means that "independent-contractor” messengers end up paying more taxes. This con job has been brought back as an anti-union tool in San Francisco and other cities, and her analysis should give any messenger pause before being hustled by it. The chapter also describes the emerging messenger movement to attain a respectable level of working conditions and income in the face of an ongoing assault on the American working class. While the first section is creditable and often valuable, Reilly really shines in Part 4: "Coast to Coast." Covering 270 pages, this book-within-a-book examines messenger life in nine cities during the 1990s. New York has the largest section with 54 pages, while San Francisco is next with 44. Some books have hidden themes that are presented by an author but in a way so subtle that even the author is unaware of it. "Nerves of Steel" is such a book. In addition to her stated themes of showing the diversity of messenger culture and a comprehensive overview, I believe that Reilly has inserted something else in this part of the book. Here she shows that America is still a place where people go onto the road to discover their land and themselves. Finding America and one's self through cross-country travel is a custom as old as the nation. Reilly, though, is the first to do so as a coast-to-coast bike messenger. While the earlier chapters read like a reference book, this section is a narrative. Here the author weaves her own experiences into the tapestry of a culture that shows that regional flavors are still distinct in America. Long-forgotten anecdotes from our own experiences are set down in print – most for the first time. Some messengers have criticized her accounts of several events as being different from their own recollections. In one story about me on page 144, her description is different from what I remember. In her account I met two little girls one day, and they wanted to sell me a balloon. But I was hungry and wanted to buy a donut. After getting the donut, I saw a man talking to them. When I walked by them, the man said to me "This girl says she is your sister." The girl seemed scared of the man so I said, "Yeah, I'm her brother. So what of it!" Reilly concludes by writing that the man left quickly and I was rewarded with a balloon. My memory of the incident is that the girls asked me for a quarter. When I hesitated, they offered to sell me their balloon. Needing change, I went to buy a donut in a place nearby. After that, my recollection of the rest of the story is similar to the book's account except that I bought the balloon as they needed a quarter to make bus fare. Both my recollection and the book's account are basically similar but with some clear differences in details. Messenger oral histories are like most folklore: subject to variations with each retelling. By putting them in print Reilly certainly hasn't barred us from telling them again in our own versions. She's simply recorded these stories in print. These anecdotes provide insights into messenger – and American – society. Some accounts describe the gulf of perception that separates messengers and other physical laborers from those who work at desks. Reilly describes an incident in a Seattle elevator where a woman states that messengers don't look at traffic because we allegedly don't turn our heads. Using only her peripheral vision, Reilly describes the woman and everything she is wearing to show that couriers "don't have to look right at you to know you're there." Later, delivering to New York fashion houses makes her wonder if the concept of spending $10,000 on a dress is because "offices are an alternate universe." This gap between messengers and indoor workers extends into courier offices. She describes a Seattle incident where a driver threatens and grabs a woman messenger, finds out where she works, and contacts her boss who then makes her apologize to the driver. This and her other accounts of cowardice by courier company CEOs will not surprise messenger readers but will hopefully enlighten non-messengers about a class-based job difficulty that is not as obvious as the dangers of cycling but is just as real and probably more common. Her anecdotes illustrate the existential and even spiritual elements of messenger life. Here are vignettes of love, anger, death, community, sacrifice, and respect. Reilly is in some as participant, in others as observer. Her portrayals of many minority messengers are welcome, considering that they continue to be underrepresented in the industry. In San Francisco there are probably fewer African-American and La Raza dispatchers today than there were ten years ago. Her final chapter is devoted to women messengers. As greatly perilous as "messing" is for men, it is fundamentally more dangerous for women. While all messengers must expect some bigotry on the job, women encounter more. Road-raging drivers usually confine their anger against male couriers to loud-mouthed profanity, yet they somehow muster the "courage" to physically assault women messengers. While not ignoring these matters, Reilly also shows the great joy that female couriers feel as well as the liberty they experience on the job. The heritage of American suffragettes – many of whom rode bicycles – is related to her own life and the lives of her peers. Grammatical errors and some typos appear sporadically in the book. A few historical items are incorrect. Occasionally her style is choppy when she strings together simple sentences. One glaring problem is the lack of captions and accreditation to photos and other illustrations. In addition, flyers and insignias are reproduced without citing the artist. This is the book's only major flaw and is a detraction that should be corrected in any future editions. An index would also be an asset. In a paragraph near the end of the book, Reilly's portrays a reclusive yet determined transgender courier with sensitivity and insight. Her befriending of this veteran messenger shows that not only is Michelle not afraid to be who she is; it also shows that Rebecca Reilly – like many of her subjects – is not afraid to be who she is. This is the ultimate strength of "Nerves of Steel," and it is this strength that is illuminated most vividly in the parts that deal with women couriers and with messengers in each city. Along with other attributes, it overshadows the many yet mostly minor faults of the book and makes "Nerves of Steel" a very worthwhile read. "Nerves of Steel" is a diamond in the rough. It needs some polishing and cutting, but it stands as a solid contribution – as reference and as narrative – to the growing genre of messenger literature. Howard Williams has been a messenger since 1982 and is a member of ILWU Local 6. The portrait of Rebecca Reilly was taken by Nancy Donnelly. The cycling photo was taken by Baijo at the 1995 CMWC in Toronto.